- Develop and implement sales action plans so that the Processing sales team achieves its orders, sales and margin targets as set out in the company’s ongoing quarterly financial projections. - Lead and manage sales strategy formulation and execution for key sales channel partners, key accounts and major projects; tender submissions and management. - Work with management to develop growth strategies for the business, including but not limited to making recommendations for new product developments, new applications developments, and potential alliances with technology and channel partners. - Meet management reporting requirements including the preparation of sales/financial reports, and the gathering and dissemination of market intelligence pertaining to customer and competitor activities in the region. We are hiring 05 Senior JAVA Programmers with attractive salary. 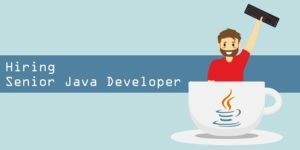 - Work in Java projects for Japanese customers. - Have good communication skills, problem solving skills, teamwork. -The opportunity to work and grow in a professional environment, modern, dynamic, multi-cultural. Address: E02-03, Tower 5, Diamond Tower, Pyay Road, Kamayut Tsp, Yangon, Myanmar. - Be in charge of general office administration job as office equipment maintenance, office layout arrangement, workplace and meeting room arrangement, welcome guests and preparing tea, etc. - Supporting and preparing documents to get work permits and visa for expatriates. - Handling incoming & outgoing documents and calls. - Support staff for business trip (booking hotel, air ticket, arrange company car). - Other tasks are assigned by manager. Please send us your CV to fptmyanmar@fpt.com.vn if you are interested. FPT Software Co.,Ltd. is a leading company in consulting and global supporting the big account over the world such as Unilever, BP, etc. this job is to be a candidate for IT support officer & Implementer for Unilever Myanmar on the NGDMS project, Distributor management system application. To guarantee the quality of our services and meet the requirements of global clients, FPT Software identifies technological advancement and standardized management process as our top priorities. As a result, FPT Software has been granted the very prestigious certifications of CMMI level 5, ISO 27001:2005 (BS 7799-2:2002), and ISO 9001:2000. FMCG company IT system experience is preferred. To work in this team, all members must attend the Unilever Business processes and NGDMS Solution training course as well as study carefully the DMS integration, data migration and implementation procedures. In addition, good communication and the ability to work far from home are expected for Rollout team. The implement is divided into several teams, each for a distributor. There is a rollout leader for managing each group of 5-10 members. The rollout leader will be taking care of monitoring rollout status and doing internal QA during rollout progress. · Opportunity to join and study in the professional, large and multi-national project of the latest SAP technology. § Please send us your CV to fptmyanmar@fpt.com.vn. NOW! - Proficiency in Japanese (N2 Certificate)(Passed) able to read and translate fluent Japanese technical documents. - Priority is given to those who have lived or studied in Japan. - Opportunity to go onsite in Vietnam, Japan. Please send us your CV to goodjobs@fpt.com.vn and fptmyanmar@fpt.com.vn. - Supporting Business Manager Development Officers in working with customers: negotiation, presentation, paperwork and related tasks. - Supporting administration tasks for FPT Telecom office when needed. - Office hour: 9am – 12pm, 1pm – 5pm, Monday to Friday. - Learning in business and technology fields is advantage. - Eager to learn and teamwork. - Working in international environment with experience officers from FPT Vietnam and partners. - Company trip and bonus. 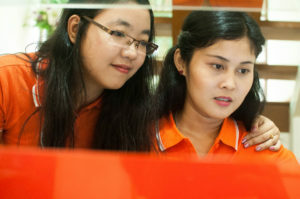 FPT Myanmar is recruiting 50 system engineers with attractive salary and benefits. Please find more information below and join us by sending your CV to email: goodjobs@fpt.com.vn 1. 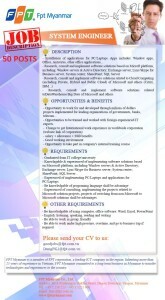 Job Description: - Installation of applications for PC/Laptops. Apps includes: Window apps, Office, Antivirus, other office applications... - Research, consult and implement software solutions based on Microft platform, including: Window servers & Active Directory; Exchange server; Lync/Skype for Business server; System center; SharePoint; SQL Server - Research, consult and implement software solutions related to Cloud Computing (including Private, Hybrid and Public Cloud) of Microsoft and others (Citrix, IBM...) - Research, consult and implement software solutions related toDataWarehouse/Big Date of Microsoft and others 2. 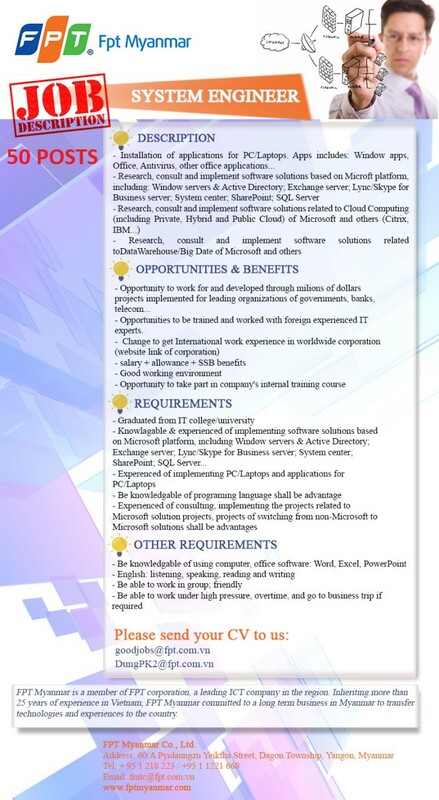 Opportunities & Benefits - Opportunity to work for million dollar projects implemented for leading organizations of governments, banks, telecom... - Opportunities to be trained and worked with foreign experienced IT experts. - Change to get International work experience in worldwide corporation (website link of corporation) - salary + allowance + SSB benefits - Good working environment - Opportunity to take part in company's internal training course 3. Job Requirements: - Graduated from IT college/university - Knowlegable & experienced of implementing software solutions based on Microsoft platform, including Window servers & Active Directory; Exchange server; Lync/Skype for Business server; System center; SharePoint; SQL Server... - Be knowledgable of programing language - Experienced of consulting, implementing the projects related to Microsoft solution projects, projects of switching from non-Microsoft to Microsoft solutions shall be advantages - Experenced of implementing PC/Laptops and applications for PC/Laptops - Be knowledgable of using computer, office software: Word, Excel, PowerPoint - English: listening, speaking, reading and writing - Be able to work in group; friendly - Be able to work under high pressure, overtime, and go to business trip if required JOIN US NOW! - Been training in the Fsoft’s QA process in one month and in project. - Responsible for product review done before handing over to customers and implementation of QA tasks as requested by projects manager (PM). - The opportunity to work and grow in a professional environment, modern, dynamic, multi-cultural. 4) Greet customers entering establishments. 5) Maintain clean and orderly checkout areas. 6) Establish or identify prices of goods, services or admission, and tabulate bills using calculators, cash registers, or optical price scanners. 8) Answer customers' questions, and provide information on procedures or policies. Please send your CV to fptmyanmar@fpt.com.vn and join our team! arrangement, workplace and meeting room arrangement, welcome guests and preparing tea, etc. - After training will come back Myanmar to implement projects. - At least 3 years of experience in .Net/ASP development. Please send us your CV to goodjobs@fpt.com.vn and mention how you know about this job opportunity! Foreign language communication skills: can translate and interpret from English to Japanese and vice versa. Basic knowledge of IT or interested in IT field. • Minimum of 1 year working experience, having experience in international working environment is a bonus. 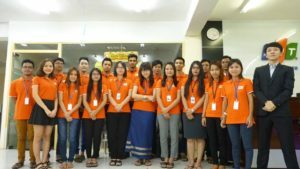 - Get on-job-training at Japanese client site about software and IT services, after that will become a BrSE in Japan or come back to Myanmar to build a team. • Must have knowledge about Linux. • Fast learning, self-confident, want to live long-term in Japan. - Round trip flight ticket.